My question is about rolling in the t spline. Your diagram shows the roller blade on the side of the grove next to the frame and it looks like you use the convex roller. What about using the concave roller and pressing down on the raised part of the t? Yes, You could use a concave roller in the way you describe. I use a roller with a flat edge rolling in the flat part of the T furthest from the screen cloth. That way there is little risk of cutting through the cloth with the roller because the vertical rib of the T spline provides a barrier. If you roll on the raised portion of the T and slip off you could end up slicing through the cloth and need to start over. Or you could just go more slowly and carefully to make sure that does not happen. 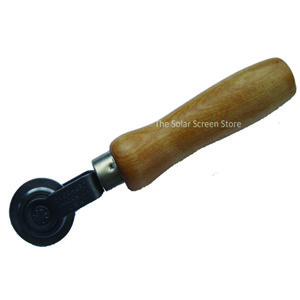 I uploaded a picture of the roller I use for just about every kind of screen.